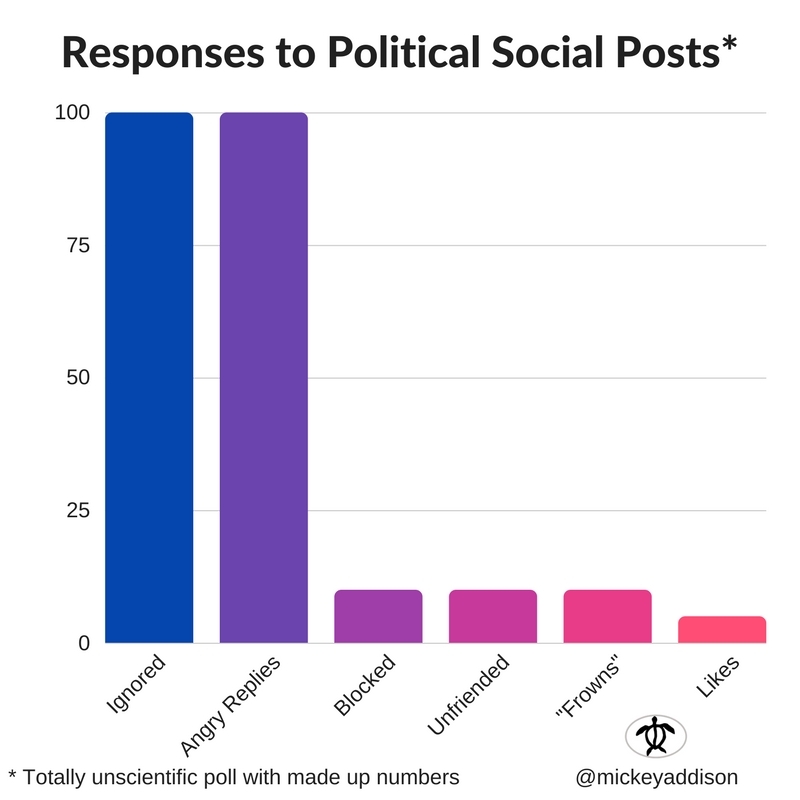 I don’t need to tell anyone that sometimes people with–shall we say strong political views?–have difficulty communicating below the 100 decibel level, especially on social media. Navigating the office and social media environment in the age of the 24 hour news cycle while maintaining your sanity and your friendships is not as easy as it once was. But it should be. It’s not that you shouldn’t have opinions, it’s just that it’s not always necessary to share your opinions. It’s important to know when to speak, to whom, and on what subject. To that end, and as a public service, I’ve developed a set of “rules” to guide online and office behavior. Before I get into the “rules” I’d like to take a moment to quote Founding Father James Madison’s Federalist 10 on the virtue of republican democratic government for resolving the inevitable “faction” that develops among people attempting to govern themselves. I also want to point out that when Madison refers to “republicans,” he’s referring to the idea of a republic as a form of government not the political party by the same name. The Federalist Papers are a collection of what we’d call today blog posts that made the case for the form of government we have today in the USA. In Federalist 10, Madison writing under the pen name Publius described both the inevitability of developing “factions” among people, and the virtue of a “republic” over a pure “democracy,” and offered a remedy for moderating the passions of the day. It’s worth the read, for sure, and is a great reminder to be optimistic about our country’s ability to work through issues and (eventually) reach a solution. You might not know it sometimes, and the Civil War notwithstanding, but Americans have a remarkable resilience and ability to solve problems peacefully, although usually loudly. OK, end of preamble, now on to the rules. 1. All humans deserve to be treated with respect. Someone else’s lack of respect doesn’t justify you doing the same. When someone is being disrespectful or rude the natural reaction is to return fire and as we say in the military, “establish fire superiority.” Resist the urge–either remove yourself from the situation or return rudeness with kindness. Trust me, it’s a far better place to be. You might feel good in the moment by “winning” but in business and in life relationship is not about “winning” or “losing,” but rather about mutual respect. 2. Public figures are humans, not messiahs and not devils. It’s very important to remember the people we see on TV are, you know, actual people. They have virtues and flaws, friends and family who love them, and their own thoughts. They make mistakes. They do good work. Public pronouncements and actions are fair game for discussion or disagreement, but be careful to separate criticism or praise of an action from criticism or praise of the person. Always give people the benefit of the doubt. We’re always free judge a person’s actions, but we’re not to judge a soul–leave that to God. 3. If you’re partisan before you’re a patriot you are part of the problem. The good of the country should always be a primary consideration, and we should always be ready to change our minds if presented with enough facts, so long as we don’t violate our values. 4. The first report is usually wrong; remember the real work of politics gets done in committee and in board rooms, rarely in public. This is also one of “Mickey’s Rules for Leaders,” and it applies to political discussions as well. Remember that just because someone told you something is true, or you saw it reported a certain way on your favorite news outlet, doesn’t necessarily mean you have the whole story. Avoid rushing to judgement. 5. Always check multiple primary sources before believing and passing on a link, no matter what the source and especially if it seems to confirm something you believe. Avoid taking someone else’s word for something; seek out primary (original) sources of information. Modern search engines online allow you to read what a person actually said and in context. If a particular report seems to confirm something you think you know already, be doubly skeptical. 6. Data doesn’t care who you are. (Corollary: if you torture the numbers long enough they’ll confess to anything). Data is data, and there’s as many ways to parse numbers as there are to count. Be open to changing your mind when presented with facts, rather than dismissing data simply because someone with an opposing ideology presents it to you. 7. I never learned anything while I was talking. Listen first, second, and even third. Then speak. This is harder than it sounds. 8. Being “pro” something isn’t necessarily the same as being “anti” something. Remember that being for something isn’t the same thing as being against something else. Begin by assuming the best about someone and asking questions, like “Did you mean to say…?” You might be surprised at the common ground you have with someone you might have thought was your polar opposite. Not always, but often we merely disagree on method, and agree on goals. 9. Insulting people guarantees they’ll ignore you. Strong language is generally a bad idea. If you’re looking to severe a relationship, that’s the quickest way to do it. There’s a reason it’s polite to use gentle language. I think us moderns have become far too comfortable throwing verbal bombs and profanity. Again, the benefit of the doubt and a little kindness goes a long way. 10. No one changes their mind based on your political Facebook post. My first month as Mission Support Group Commander at the Air Force Academy was wonderful. Sure, there was work to do, but I spent the first few weeks touring the campus and meeting many of the 2,600 people who I led. There were plenty of awards to hand out, challenge coins to deliver, and interesting people to meet. When I was on horseback with the Academy Stablemaster touring the South Training Area, I thought to myself, this is the best command I’ve ever had! Of course, all honeymoons end and sooner or later a new leader has to stop being “oriented” and get to work. It certainly wasn’t going to be two years of kissing babies and riding horses through the Front Range. Previously, we talked about the first 30 days after your “change of command.” The job of making a successful transition isn’t over at Day 30; in fact it’s only just begun. If your transitions are like mine, the first 30 days are the easiest. Those goals could be as modest as making a plan for later, or as ambitious as sweeping changes in the organization and products. Whatever your goals, and whatever changes you want to make in your team, once you announce where you intend to go focus your energy and organization on getting there. You’re credibility is now in play, but this is exactly why getting your team on board with you in the first 30 days is so important. Some organizations will need a firmer hand than others, but whether you’re turning around a failing organization or taking an already high performing team to the next level, you’ll need a team effort. Once you reach the 100th day recognize your work is only beginning. As a senior leader your “grace period” is finally over–you’re no longer the “new guy” and you own all the successes and failures. If you’re turning around a failing organization it’s unlikely you made any significant progress in the first 100 days and they’ll be plenty of work left to do. A high performing team will be accustomed to you at this point, so it will be important not to let them rest on their laurels. Make adjustments in your leadership style and continue to lead from the front. A solid first 100 days will set the tone for the months and years ahead. In the previous three months, I’d prepared as best I could and now it was “go” time. Under the big Colorado sky on a stunningly beautiful summer day, thoughts about both the mission and people I was now responsible for leading circled my mind. All my previous leadership experience, all my networking, all my preparation had come to this moment. When it was my turn to speak, I stepped up to the mike and began my command. Changes in leadership like the assumption of command I described above are often planned and announced in advance. Retirements, promotions, and the like create openings in leadership positions in all organizations. Even when someone gets the sack, there’s usually time for some limited preparation. That time is important because every team is different, and there is no one-size-fits-all approach that works. Even experienced leaders will need to make adjustments to their own style to suit the new team and mission. If you have a good transition, your predecessor will have sent you plenty of information and planned a Left Seat-Right Seat time. If the transition is short or unplanned, your prep time is limited. No matter how long you have, spend it learning as much as you can before you arrive. Mission statements, public financial records, customer reviews, press releases, and anything available on the personnel. You’ll get two opportunities to speak to the team, once in public and once to your senior staff. Plan those talks carefully: first impressions really matter and it will be obvious if you haven’t done your homework. The military conducts a change of command ceremony where the outgoing and incoming commanders exchange the unit’s flag as a symbol of passing the leadership of the unit. Those ceremonies and their civilian equivalents are all about the farewell for outgoing leader. As the new guy, your job is to thank everyone, give a brief version of your priorities, and get off the stage. Give your predecessor the room to bask in the adulation of the team one last time; it’s your team now and you’ll have plenty of time with them in the coming months and years. During your speech, be gracious to the outgoing leader–even if he/she doesn’t deserve it. No matter what the circumstances that required a change in leadership, it’s not your place to pile on or take issue with the outgoing guy’s style or achievements. They know him–they don’t know you–so being gracious will make a good impression. It’s just good manners. I assure you no one will remember the “bumper stickers” you talk about at the ceremony, but they will remember if you’re snarky, rude, or go long. Get up, say your piece, and get off the stage. On your first day in the seat, you’ve got only two things to do: meet with your senior staff one and one and as a group. Use that time to get to know them better, get a sense of their professionalism and proficiency, and lay out your strategy and priorities. If you have an office or administrative staff, give them your expectations on how you expect work to flow. They’ll want to know how you like to organize your day and about any pet peeves you might have regarding the logistics of running the office. Once you’ve met with your senior team–we call it a “command team” in the Air Force, it’s time to meet with the larger senior staff as a group. Plan to spend about an hour, and lay out your priorities and guiding principles, your expectations, and let them know where you’ll be focusing your attention. A few Powerpoint slides or a handout is a good idea since it allows them to listen better rather than taking notes. Allow them all time they need to ask questions–few of them will take you up on it anyway–and then give them a preview of what you plan to publish to the entire team. This is the first step to gaining their trust and getting them on board for where you’re planning to lead them. Set some achievable goals for the first 100 days and ensure your new team is on board. During the first month, commit to spending time looking around and listening to your new team. As a rule of thumb, and unless something is badly broken, dangerous, or illegal, don’t make any changes for the first 30 days. This gives your team some breathing room to get used to you, and more importantly, time for you to understand why things are the way they are in the first place. Rare is the case where a leader or an organization is completely incompetent. Understand the context of your predecessors’ decisions before you begin making changes. Doing so will help avoid unwanted second and third order effects, and it will give you a better chance of finding root causes of problems rather than just symptoms. Make time in the first few days to have an “all hands meeting” and address the entire team. If your team is geographically separated, then record your session and make that recording available to them. During that all hands meeting, lay out your priorities and principles Boil down your priorities and principles into 2-4 easy to remember phrases. You want your “slogan” to be memorable and easy to repeat–you’ll be repeating it often. Give the broad strokes to the whole organization, and spend some time with the senior staff to be sure they understand clearly who you are and where you intend to go. Lastly, get a thorough orientation to your new organization unit by unit. Resist the temptation to spend that entire orientation in a conference room reading PowerPoint slides. Whenever I take over a new organization I spend that first week or so walking through each unit and learning as much as I can from the people doing the actual work. You can read slides on your own–you need to see where people are working and let them tell you what they’re doing. Believe me, you can tell a lot about an organization by asking questions and observing the work environment. The morale will be self-evident and you’ll gain important insight into what needs to be changed on day 31. Every four years or so we grade our leaders on their “First 100 Days,” but other than watching pundits debate on TV what does that mean for us? It’s an opportunity for us to take a look at our own progress toward our goals. We’re certainly not going to have Bret Baier talking about our performance on his TV show, but the “100 day” marker is a good reminder to for us self-evaluate. Well, for the same reason we follow our progress on a map during a road trip–to know how close to the destination we’re getting. Knowing where you’re headed is important, of course, but if you don’t know where you are, you’ll have no idea whether or not you’re actually getting there. Do we need to have started a new job or something in order to grade ourselves on our own “First 100 Days”? Nope! We can do it at any time, and 100 days is a fabulous reminder and a convenient period of time. Not too long to let things get out of control, and just long enough to show some real progress. So, how do we do a self evaluation? What was my actual goal? I know this sounds basic, but it’s easy to get off track and forget why you started your journey in the first place. That’s why I always recommend writing your goal down! Goals should be specific and actionable. If you resolved to “get in shape” or “advance in your career”, what does that actually look like? A better goal is “Lose 10 pounds” or “get a promotion to senior manager”–specific targets are always best. Have I reached the goal? Be honest with yourself. If you wanted the promotion and you didn’t get it, that’s easy to judge. Fitness goals can be a bit more “fuzzy”, as are relationship goals. If you’re “there”, you should be able to track measurable progress. On the other hand, if you find yourself making excuses–well, you’re likely not there. What are the steps I need to take to get back on course or stay on course? This step is a bit more difficult, of course, but if you were honest with yourself in the previous step, this one is manageable. Visualize your goal, and write down the concrete steps you plan to take to get there in the next 100 days. You don’t have to get there in a single “step”–some goals take a lot of work–but by setting smaller intermediate goals the bigger goals become reachable. Need some additional help? Check out the Resources Page for downloadable worksheets and links to helpful sites. 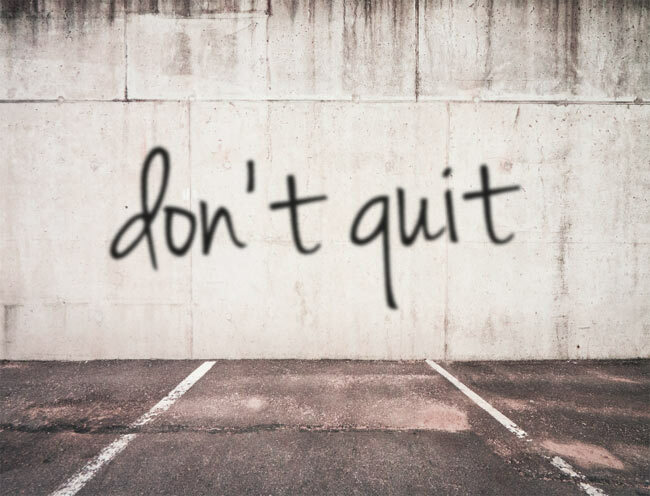 Remember, the only real failure is quitting–never quit! It was the second time I’d been sent to fix a broken unit, only this time the unit didn’t know they were broken. The team had all the externals of a high performing team, but only on the surface. Below the surface, they were dysfunctional and broken. The organizational chart bore little resemblance to the actual power structure within the unit. Senior non-commissioned officers who were supposed be leading at the first line exercised little actual leadership. Relationships with the customers of the unit were frayed because my predecessor had mystified the process to the point where “yes” seemed an impossible dream. Readiness indicators were at the lowest possible levels, disciplinary actions were severe and routine for everything from multiple DUIs to a wave of failing fitness tests. As the unit’s leadership team looked at me, they really didn’t expect much from me. I was coming from The Pentagon and everything they’d heard from my predecessor was that I was an uptight headquarters “weenie” who knew nothing about the “real” Air Force. On top of that, several members of the command staff were not only uninterested in working with me, they were actually hostile to what they perceived of my agenda. So began my first 100 days in command. Last week, I wrote about taking the reins of leadership and the do’s and don’ts for the new guy. This week’s post is all about taking over a failing organization. There’s many variations on the theme of fixing something that’s broken, but it really boils down to two: (1) they’re broken and they know it, and (2) they’re broken and they don’t. The second one is the hardest. If a team is broken and they know they’re broken, there’s some hope you’ll be able to get the team working together toward repair during the first 100 days. 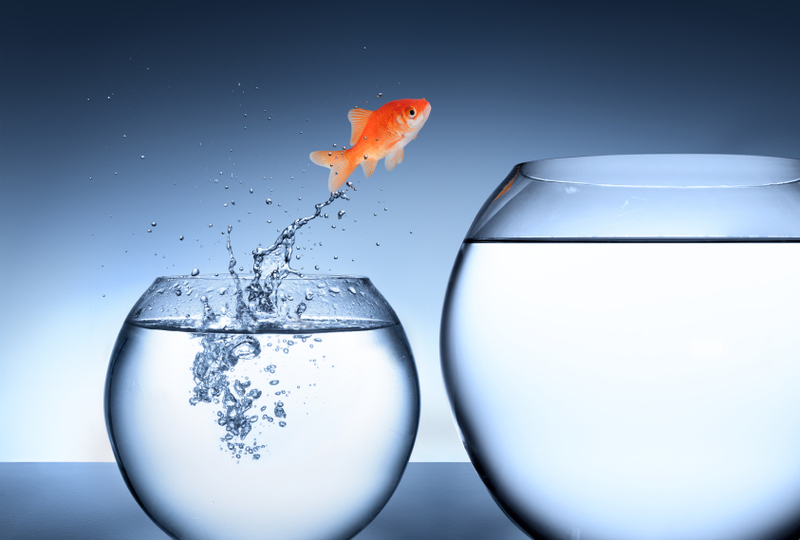 If you’ve had a good transition, your new team will be looking at you hopefully. Your task as the new leader is to have a plan or make one quickly. If your new team knew how to get themselves out of the mess they’re in, they’d have done it already. However, just because they don’t have a plan doesn’t mean they don’t know what’s wrong. Even if they’re looking to you as their savior, simply dropping out of the sky and imposing a get-well plan on them will guarantee resistance. You have to have a plan, but you have to get their assent. There’s no “checklist” or single solution to leading a broken team to high performance, but there is a method. This method has been successful many times, but you’ll have to take into account the personalities and team dynamics. Lay Out Your Priorities and Principles Immediately. As soon as you assume the mantle of leadership, you need to lay out who you are and what you’re about. Your new team will have heard all about you, and much of their “intel” will likely be superficial at best. Even if their intel is correct, your approach may be very different than with a previous team because of the situation. For example, you might be easy going with a previous team–what the military calls “low maintenance”–but the new team may require a firmer hand. Boil down your priorities and principles into 2-4 easy to remember phrases. You want to be memorable, and easy to repeat–you’ll be repeating them often. Something like Readiness-Responsiveness-Resiliency or Sustainability & Responsibility works well; use alliteration and rhyme to make it easy to remember. Give the broad strokes to the whole organization, and spend some time with the senior staff to be sure they understand clearly who you are and where you intend to go. Look and Listen. Regardless whether they know they’re failing or not. you’ll need to listen to your team to find out what they know and look around to make an assessment of the operation. Commit to your team to make no changes in the first 30 days unless it’s absolutely necessary. Your senior staff especially will be anxious and perhaps even defensive about making changes no matter how necessary. The 30 day buffer gives you a chance to listen to your team and find out what they think is important. It also enables you to discern who will be you ally, and where the landmines are buried. Make a Plan with your Team. Be as Collaborative as You Can. In a perfect world, you and your team would sit down over the course of a few weeks and assemble a plan to fix their problems. No matter how hostile the team is to your strategy, leaders have to at least try to work with the team and get them on board. Even when you know exactly what’s broken and how to fix it, you’ll need to give your team some ownership and a stake. Do that by spending time planning with your team. Use as many of their ideas as you can, and then give them a stake and a role in implementation. Make them partners and stakeholders in the successful implementation of the plan. If collaboration just isn’t possible, then you’ll have to go it alone, In that case, be sure your boss is on board then give your orders and follow through. In all cases, your people will need you to inspire them and lead them. Any change of leadership is difficult, but it’s impossible if the leader doesn’t take his job as “Chief Cheerleader” seriously. Even when most of the team isn’t even aware they’re broken they’ll want to know you’re rooting for them. The military change of command ceremony is rooted in centuries of tradition back to the time of Frederick the Great. In the days before radio communications, the unit’s commander used his flag as a symbol of command and to signal movements on the battlefield. Leaders would physically hand the unit’s organizational flag from the outgoing to the incoming leader to symbolize the transfer of authority. Civilian companies have their own way of transferring authority, but the effect should be the same: a visible transfer of authority from “old guy” to “new guy.” Unless there’s compelling reason not to have a ceremony, like the previous leader was removed or left unexpectedly, doing a “change of command” ceremony is an important tool to keep a unit moving forward during what can be a disruptive time. 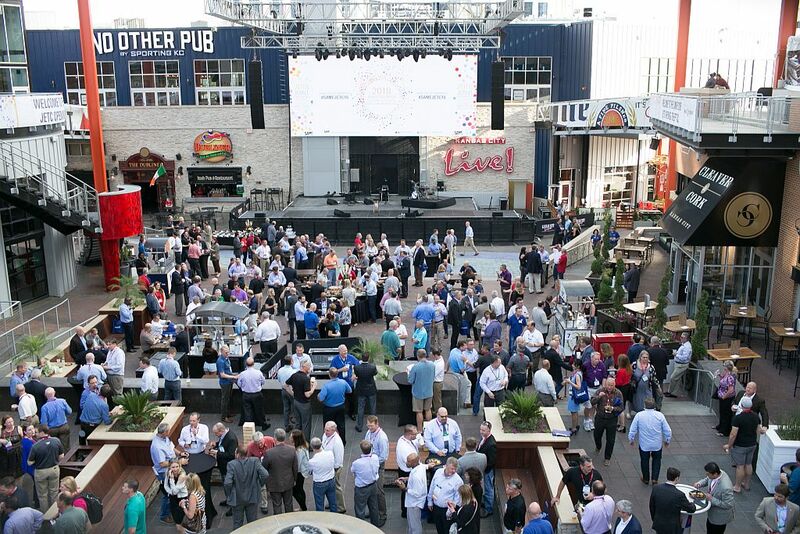 In a previous post, I wrote about what to do as the outgoing executive leader. This week we’re talking about the “new guy” at the executive level. The basic structure of a change of command ceremony is unchanged for centuries. The two leaders–outgoing and incoming–come out together led by the leader at the next echelon above. The organizational flag is passed from one to the other, then both make brief remarks. For the outgoing commander, this is a time for farewells and the ceremony is predominately for the outgoing leader and the team to make a formal break. For the incoming commander, it’s time to briefly introduce command philosophy–and get off the stage. There will be plenty of time for more later. 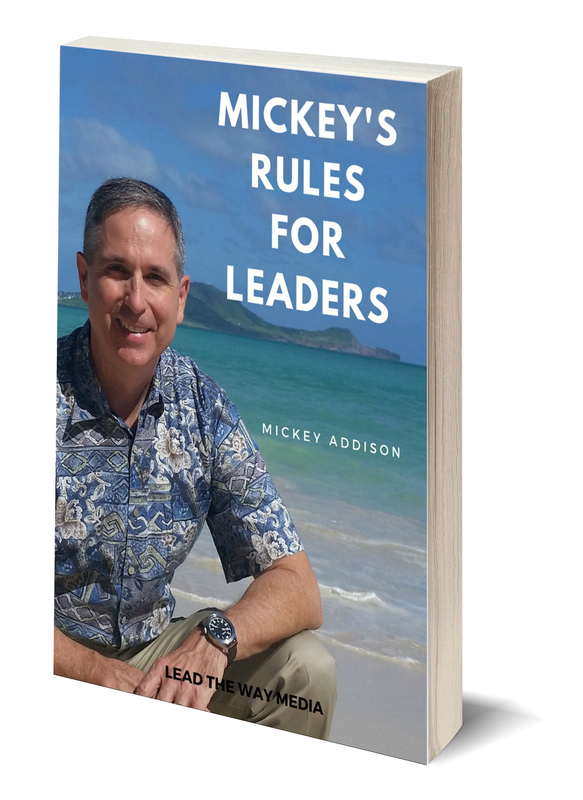 In non-military organizations and especially for executive leaders we often separate the two events–a retirement or farewell for the outgoing leader and some sort of welcome for the incoming–but there’s real value in the team seeing the transfer of authority from old to new. In a handshake, the passing of an “artifact” like a pen or even a coffee mug can be a powerful symbol of the transfer of allegiance. 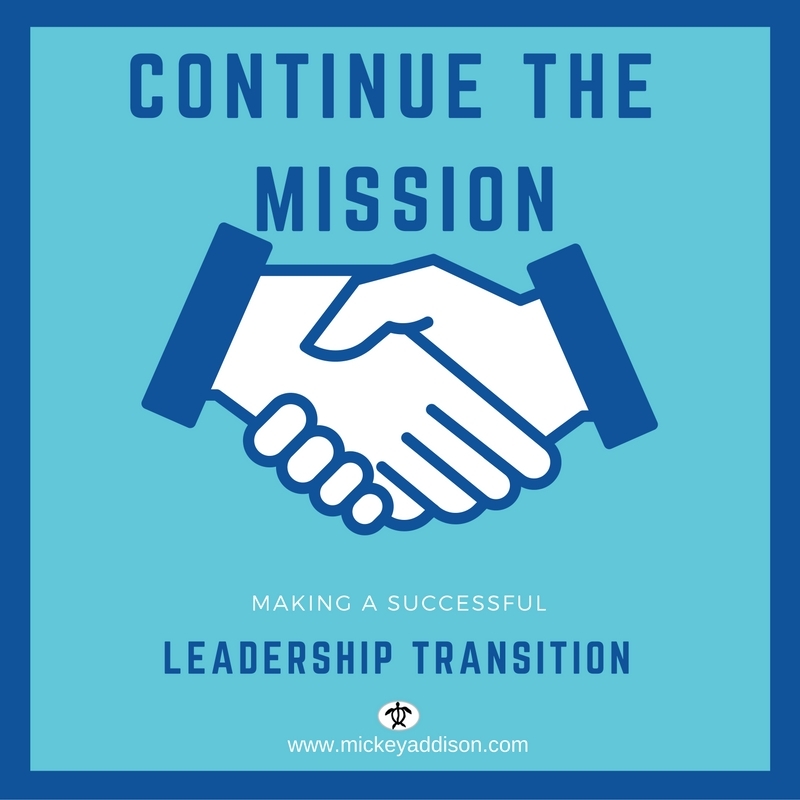 Making that transfer public and tangible goes a long way to enabling the organization to go on successfully under the new leader. The first 30 days are a critical time for new leaders because first impressions are lasting ones. Use that time when you’re still the “new guy” to learn as much as you can about the team, the organization, and the processes. During your first day on the job, meet one-on-one with key senior direct reports, administrative assistants, and the team as a whole. Help them understand your guiding principles and your priorities for your time at the helm. Your administrative staff, if you have one, will be keenly interested in your likes and dislikes for running the office, keeping your schedule, and passing information. Your key direct reports will want to get to know you, and you them, as well as understand what changes you intend to make. Once you’ve met with your senior direct reports–we call it a “command team” in the Air Force–it’s time to meet with the entire staff as a group. Spend about an hour, and lay out your priorities, guiding principles, and your expectations. I always included few PowerPoint slides or a handout so they could listen better rather than taking notes. Be sure to allow them all time they need to ask questions–few of them will take you up on it anyway. Lastly give them a preview of what you intend to deliver to the entire organization during your upcoming “all hands call” and seek their feedback. Again, you’re not likely to get any feedback, but people appreciate being asked and any feedback you get tells you something about the people you’re working with. Make time in the first few days to have an “all hands meeting” and address the entire team. I always tried to do that in the first week, the first day is best. If your team is spread out over many locations, then record your session and make that recording available to them. Like in the meeting with your senior staff, lay out your priorities and principles and make it memorable. You want your “slogan” to be memorable and easy to repeat–you’ll be repeating it often. This is your real first impression–make it count. As a rule of thumb, and unless it’s absolutely necessary, avoid making any changes for the first 30 days. Understand your predecessors’ decisions before you begin making changes; this will help you avoid unwanted second and third order effects, and it will give you a better chance of finding root causes of problems rather than just symptoms. Finally, during the first month make a deliberate effort to get around to as many work centers and offices as humanly possible. Avoid spending that entire time in conference rooms–you can read on your own time–you’re there to meet the people and see where they work. Whenever I take over a new organization I spend that first week or so walking through each unit and learning as much as I can from the people doing the actual work. You can tell a lot about an organization by asking questions and observing the work environment, and that sort of listening and personal contact means a great deal to your people. Once you reach your 31st day, you’ll be ready to begin moving the organization forward on the path you choose. What’s more, if you do these first few weeks well, you’ll have a team ready to move with you. Of course, not every situation can wait 30 days. Sometimes an organization is broken and stakeholders want action now. Take as much time as you can; time spent preparing the team to accept you as the new leader and to accept your agenda is like money in the bank waiting on you to cash the check. A smooth transition will make Day 31 possible. A good transition begins with a good culture—and the military culture is a learning culture. Because we work in a dangerous business with a highly mobile workforce, we’re always teaching someone else to do our jobs, and we’re culturally primed to think about how to hand off our work to our successor. For the military servicemember, the mission and the team are always more important than any single individual. Clearly defined processes: When work processes are clearly defined, and documented, the people are able to pass their knowledge on to others. In the military, we often maintain a “continuity book” with checklists, contact rosters, and applicable regulations/resources we used to do our jobs. The theory is if someone isn’t there, another person can step in and do the work. Leaders are no different, and all of us in command and leadership positions have a collection of briefs, memos, and rosters. This idea has applicability to any organization—no private or public team can afford to have a single point of failure. If the organization fails because “Sam” is the only person on the team who knows how to do a certain task, it’s not just Sam’s fault for not ensuring he had a backup. It’s the fault of his teammates for not looking out for him, and the leader for not ensuring there was no single point of failure. Leadership magnifies that responsibility. Training is valued and resourced: Constant training is integral to the military culture. We dedicate time and money to ensure people remain proficient at their assigned duties. Spending time and money on training returns dividends in the forms of increased proficiency and team effectiveness. 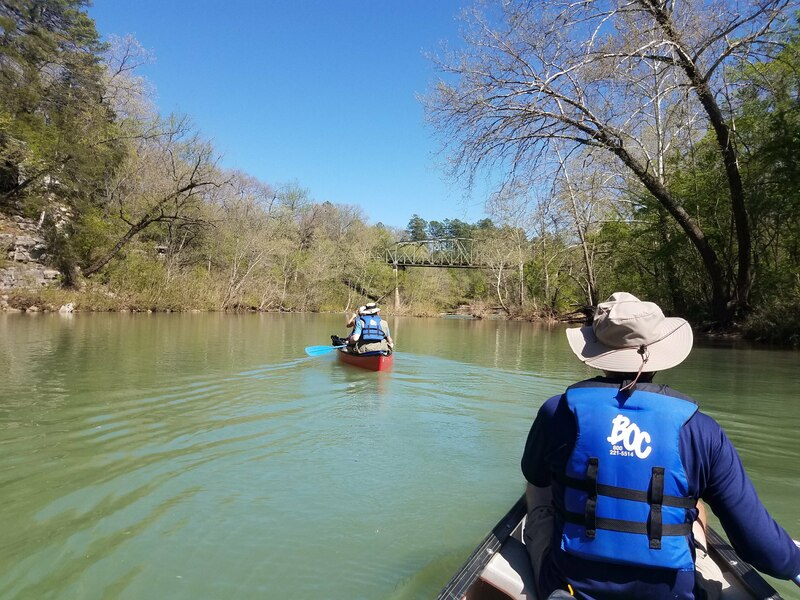 When training is done in groups, there are additional intangible benefits of encouraging learning, cross-functional knowledge, and team cohesion. The bottom line here is when the boss believes something is important, so will the team members. Leaders encourage and model cross-functional expertise: Leaders must set the example when it comes to establishing and maintaining a learning culture. In addition to resourcing training, leaders should know how the organization functions and how the various pieces fit together to produce the whole. This means leaders must be visible and engaged. In small teams, leaders should be able to step in and perform some if not all jobs on the team. In larger teams, leaders clearly there’s not enough mental bandwidth to know every job—but leaders surely ought to know what the various business units do to accomplish the mission of the team. Once a successor is named, the real work begins. Reach out to the incoming leader and ask them about what they’re thinking and what they need. Prepare the staff as best as you can on who the new leader is and what they’re agenda might be like. Model the desire to help the new leader be successful to the team. For example, as an outgoing leader I avoided making long-term decisions that weren’t absolutely necessary. When possible, consult with the new leader—particularly on personnel decisions the “new guy” must live with. Clearly, there’s only one leader at a time, but you can ensure the organization you’ve invested yourself in and the people you’ve dedicated yourself to leading will be successful by putting energy into the transition. Lead the team all the way to the moment you hand over the reins to the new leader, and encourage your team members to be prepared for the new agenda. One final note: never, ever, bad-mouth the incoming or outgoing leader. If you’ve got nothing good to say, then don’t say anything at all. Being negative doesn’t help anyone, least of all your team, and only reflects on you. Adopting a servant leader mindset, you can ensure a smooth transition that leaves you free to move on to other things, and your team prepared to continue their success. I tried to stay out of sight, but I just had to return the car keys. Calling my now former deputy, I asked him to meet me in the parking lot so I could return his car keys. “Why don’t you just come up?” he asked. “I’ve already said my good-byes,” I replied, “it would be weird.” He chuckled, “Just leave them in the seat, I’ll get them later. Have a great flight Sir!” he said. Such is the dance of the outgoing commander. The lesson of “passing the baton then be gone” is instructive for any leadership transition. In this week’s post: tips for the outgoing leader. A successful transition depends as much on the outgoing leader as it does the incoming leader. For the high performing leader, loyalty to the organization and the people we work with are a primary concern. The outgoing leader should make it a priority to help the “new guy” integrate into the team and prepare the team for the new leader. Of course, the terms of your departure often dictate how much you’ll want to–or even are able to–help your successor. If you’re being sacked, or if the split is not amicable, then transition planning is more difficult. That said, the way a leader departs a job is important to preserving your reputation as well as ensuring the team doesn’t suffer when there’s a transition in leadership. This is especially true for executive departures. Nothing is gained by allowing the departure of one executive to become a drama-filled event! Download the Transition Countdown Infographic! The five principles below are my guide for a smooth transition of leadership. As I wrote on the General Leadership blog, good transition planning begins weeks or even months in advance. In fact, most of the work for a successful transition of leadership is done by the existing team. Prepare the Team for the New Guy’s Style. Every leader has their own style, and the “new guy” might have one radically different than yours. In a perfect world, the new leader’s style is similar to yours, but that’s rarely the case. You don’t have to make any adjustments to your own style, but it’s good to be mindful of the change that’s coming. If you can make adjustments to prevent the staff from being “shocked” by a radically different style, so much the better. In any event, spend some energy with the senior staff to prepare them for the change. Leave a Trail of Breadcrumbs on Your Decisions. Leaders make decisions based on the the best information we have at the time. While any executive should be prepared for their decisions to be reversed by their successor, we can maximize the chances good decisions can remain in place by documenting our decisions well. I term this idea “leaving a trail of breadcrumbs.” Keeping good records, making sure staff who remain through the transition understand the decisions, and ensuring the new executive has access to the reasons why are all ways to ensure good decisions last. Plan for Overlap “Right Seat-Left Seat” Time. In the military, we call the leadership overlap time “Right Seat-Left Seat” time. The term comes from the positions in an aircraft or combat vehicles where the co-pilot and the commander trade places when after the co-pilot becomes familiar with the mission and vehicle. For executive transition, planning for a few days of overlap is crucial to success. Use that time where the incoming leader (“Right Seat”) shadows the departing leader to learn the staff and see how things are run (“Left Seat”). The staff can brief the new leader, the outgoing one can be on hand to explain things, and most importantly the staff can see a responsible and smooth transfer of power. When the incoming leader moves to the “Left Seat” he’ll be thoroughly prepared. Don’t Bad Mouth the New Guy or the Old Company. This one is very important. No matter whether the incoming leader is a saint or, ahem, sinner, bad mouthing the “new guy” is unseemly and unprofessional. Remember, you can’t control others’ actions–but you can control your own. How you behave before, during, and after a transition says more about you than your successor. Resolve to be kind and mature. Say Your Goodbyes and Then Take Your Leave. Nobody likes the “old guy” hanging around–it’s awkward. Once you hand over the reins to your successor, say your good-byes and take your leave. If you care about the organization and/or the people you’ve led, then allow them the space to get to know their new boss and start working his way. There are dozens of reasons for a change in leadership, ranging from retirement to getting the sack. For leaders at the executive level, managing that transition no matter what the circumstances says a great deal about us. Make that transition successful. It was very dark and cold on the flightline at Ahmed Al Jaber Air Base where teams of Airmen and a Kuwaiti contractor were working furiously in the desert night to repair a critical fuel line prior to the start of Operation Iraqi Freedom. The fuel line had been damaged in the 1991 war, and we were racing the calendar to get fuel to the airplanes who would launch the opening of the liberation of Iraq. No one knew the exact date we’d “go north,” but we all knew it was soon. Getting the air base ready for combat was our purpose. Watch almost any military story told on film and you’ll eventually meet the “Colonel Jessup” character–you know, the guy who feels the insignia on his sleeve or collar entitles him to give orders that are followed without question. It’s a popular myth, but it is a myth. While there are certainly occasions for swift and decisive action, good leaders know people aren’t robots and need to know the “why,” especially if there’s danger involved. Further, and more to the point, when leaders give their people a purpose larger than themselves instead of just a paycheck, their relationship transcends the transactional and enters the realm of high performance. We actually do an exceptional job in the military of giving people a higher purpose to attach to themselves and their work. It’s part of the military leadership model to ensure the team understands and to the maximum extent possible buys into the mission. In war, especially modern war, we expect even the most junior leaders to understand their commander’s purpose and even anticipate that commander’s decisions. The military orders process includes rehearsals and detailed explanations of the plan. We explain how individual tasks fit into the overall plan. Furthermore, military leaders know our work is dangerous and so spend a great deal of energy motivating their teams to understand the risks and why those risks might be necessary. It’s the same in the day-to-day training environment. Leaders spend energy personally helping the entire team, from the newest “one-striper” the the seasoned veterans understand and appreciate their contribution to the overall mission. It’s common for people to be able to connect even the most mundane tasks to the mission of the larger unit–it’s often the unit motto. “We fuel the warfighter!”, “No comm, no bomb!”–you get the idea. Regardless of whether someone is carrying a rifle, flying a plane, cooking a meal, or repairing an air conditioner, he knows how his particular job contributes to the larger mission. The most successful private sector companies are very good at giving their employees a purpose instead of just a paycheck. There are loads of great examples, but Recreational Equipment Inc (REI) and Space Exploration Technologies, Inc. (SpaceX) are among my favorite examples. REI sells outdoor apparel and equipment, and SpaceX is in the space launch business. Despite being in vastly different industries, they have many things in common. Both companies are innovators, with REI crushing their competitors with record sales and profits, and SpaceX setting a new standard for space launch. 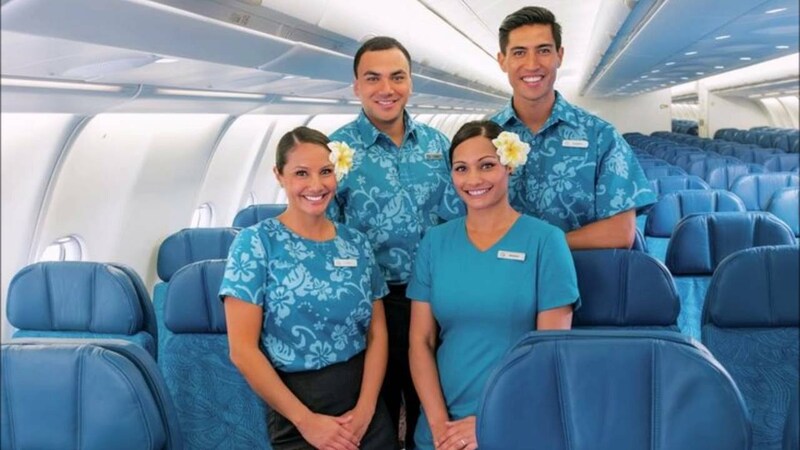 They also have something else in common: they are impressively successful at giving their team members as since of higher purpose–a mission. For REI, their mission is to get people outside to enjoy the great outdoors; SpaceX is going to Mars. To these teams, their purpose is a greater motivation than the bottom line. To be sure, profit and loss statements are the lifeblood of any business—but the heart and soul of that business is the purpose. Leaders who can inspire by connecting individual effort to the overall mission of the organization are the ones who can get high performance from their teams. When that purpose itself is inspirational, so much the better. Case in point is the video below—SpaceX employees cheering the launch and landing of their Falcon 9 rocket like it was the Super Bowl. That sort of excitement doesn’t come from a good compensation package. It comes from visionary leadership energizing the team with the knowledge they’re part of something important. It’s no surprise then, that REI is in an elite category for outdoor equipment and SpaceX is about to launch the same rocket for the second time dramatically lowering the cost of space travel. Not everyone is going to Mars or helping people enjoy the great outdoors, but every business leader can help their teams understand their contribution to society and community. Retailers supply the needs and wants of the community, service industry businesses are the fuel for other businesses, city service providers keep the community clean and healthy. All but the most esoteric of luxury businesses contribute directly to the well-being and success of the community. The lesson is this: If you want to lead your organizations to high performance, the inspire them first by giving them a purpose, not just a paycheck. Originally posted on General Leadership. If you’re a member of a certain “experienced” generation—ahem, mine—then you’ll remember a television show called Gilligan’s Island. It was one of my favorites, and there was often a lesson in the antics of the hapless castaways from the fictional S.S. Minnow, and the title character, Gilligan, was the First Mate. While his bumbling was the comedic center of the show, I think Gilligan probably taught more to his fellow castaways (and the audience) than even the creator Sherwood Schwartz intended. It was advice that sticks, and it “stuck” because the audience and the castaways learned the lessons together. 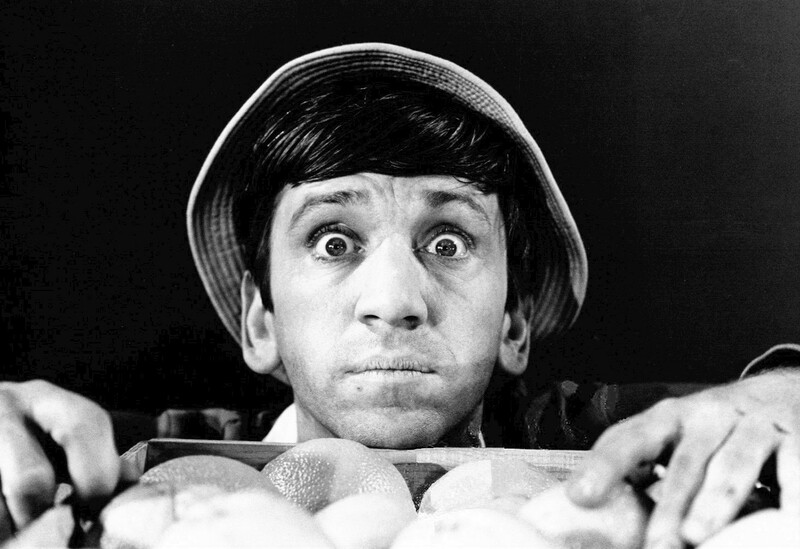 Of course, Gilligan’s Island was comedy, not philosophy. 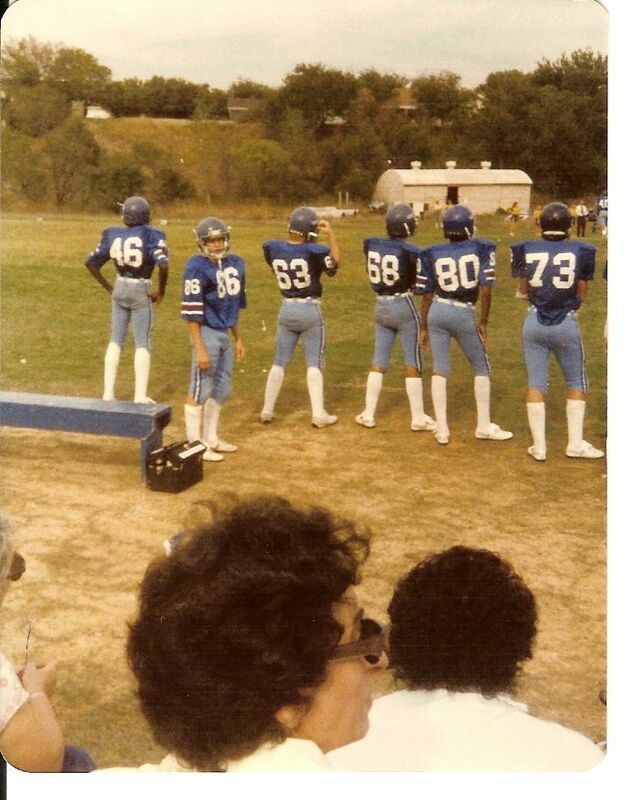 “Can’t Never Could Do Anything” (Mickey’s Rule #4) – This originated with my Dad and have been words that motivated me as a skinny 14 year old yearning for gridiron glory AND as a 51 year old colonel! Keep a positive attitude and can-do spirit and you can be mighty! “Drink Your Water, Eat Your Lunch, and Make New Friends” (Mickey’s Rule #10) – advice from a pre-K kiddo that was wise beyond his years. Live your life in balance and always look for new friends. “People Are Not Machines” – advice from one of my first squadron commanders to remind me that my Airmen were humans and needed to be treated as such. Leaders can expect a lot from people they treat well–and very little from people they abuse. “Start Your Day with a Prayer” – a surprising number of senior leaders from all walks of life, both military and civilian, spoke to my Air Command and Staff College and Eisenhower School classes about the need to begin your day with some form of prayer or quiet time. Don’t discount the need to feed your spirit. “Remember, Thou Art Mortal” – When victorious Roman commanders paraded through the city with their spoils to the cheers of the citizens, there was always someone whispering in his ear, Memor, sis mortalis (Latin: “Remember, thou art mortal”). It’s easy to believe your own press, stay humble. “Keep Your Head Down and Your Eye On the Ball” – advice from golf and baseball coaches that work for either sport, and in life. Basically, focus on what you’re doing now and avoid distractions. “Stay In Your Lane” – more sports advice from my high school football coaches. For the kickoff team to be successful, everyone has a job to do–lanes to charge down–and if you’re doing someone else’s job you’re not doing yours! “Be Kind” – it’s easy to be mean, it takes effort to be kind but it’s worth it. Being kind doesn’t mean you can’t be truthful or even make hard decisions, but it does mean respecting the other person enough to treat them with respect. Advice that sticks – that’s the best kind! 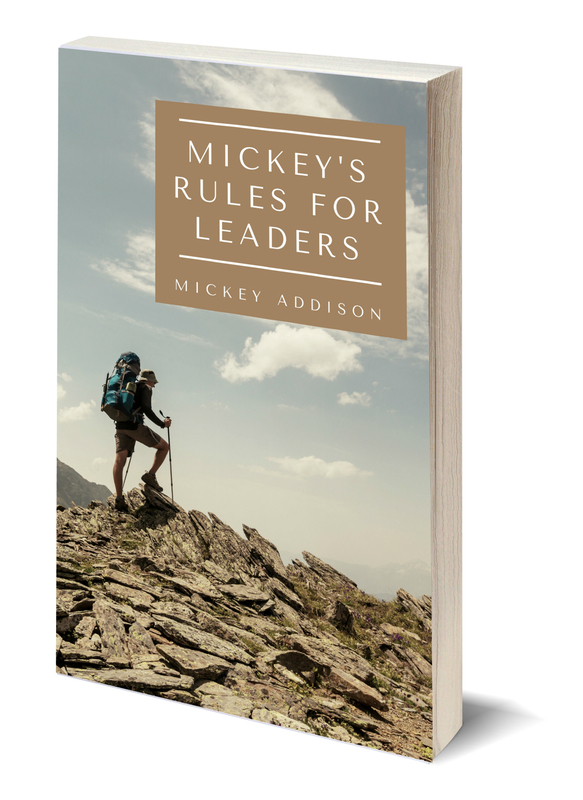 Mickey is the author of seven books, including Leading Leaders: Inspiring, Empowering, and Motivating Teams and The Five Be’s. He’s a frequent contributor to industry publications and blogs. In 2013, I completed a personal goal of riding in the Honolulu Century Ride, 100 miles through the beautiful Hawaiian countryside and back to Honolulu. It’s a great lesson in goal setting. In 2013, I accomplished a personal goal by completing a “century” bicycle ride. On hundred miles in six and a half hours flat on a bicycle took commitment to a training schedule, some acquired knowledge on endurance nutrition, and not a small amount of determination to finish. It’s rare, I think, to accomplish any big goal without checking off intermediate goals first. Breaking difficult and complex tasks down into a series of steps is a good way to cope with big projects. Sometimes biting off the entire thing can be overwhelming, intermediate steps make the big project manageable. 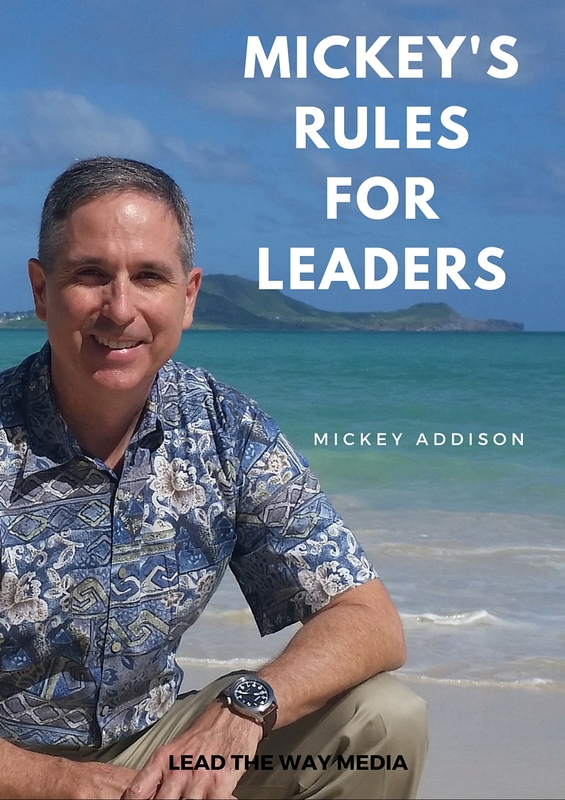 When I was going through the executive leadership curriculum at the Industrial College of the Armed Forces (now the Eisenhower School), speakers and readings continually repeated the notion that executive leadership was different; that the skills we learned as majors and lieutenant colonels would not make us successful as colonels and generals. At the time, I gave that idea little credence. “Leadership is leadership” I thought to myself, how could it be that different? Then I graduated and went on to an executive position at the Pentagon and found that everything they taught me was–wait for it–true. Executive leadership was different! I spent a lot more time gaining consensus around ideas and building relationships than giving orders and making plans. I had fewer people reporting to me on the staff, but more people from whom I needed support to further my goals. Less details and more concepts. More strategy and less tactics. That particular “ah-ha” moment for me was after I returned from a meeting where my senior executive boss sent me to represent him. When I returned, I started to relate the topics of discussion to him and he stopped me to ask, “Who was there?” I responded with the names of the various organizations represented and he stopped me again, “No, no…who was there?” (meaning, he wanted to know the names of the people at the table). Then he asked me, “Where were they sitting?” The seating chart and the names of the people in the meeting told him something important. It told him what his peers thought and their relative importance to the Principal. The lesson was less about “office politics” and more about the way senior people work with each other at the senior levels. Executives work more through relationship and collaboration than through strict lines of authority. That’s not to say formal authority isn’t important–but it’s less important than the informal influence senior leaders exert.